Children who grow up with a furry pal are generally more open and less prone to allergies. That is why so many families choose to get a pet dog. When a dog and a child grow up together, proper parental guidance can ensure the deepest dog and baby bond. Health and emotional benefits that come with this can be of immense value for a child. You have to be a bit careful when the moment of introduction comes. In general, it’s recommended that you bring the dog home first. This will help relax the dog and allow it to get familiar with the environment. Before you introduce your baby and the dog to each other, give your dog a piece of your baby’s clothing so that it can sniff it and get used to the baby’s smell beforehand. When introducing your dog to your baby, you should put your dog on a leash and hold it firmly. Of course, make sure that the dog isn’t uncomfortable in any way. The dog should be cuddled all the time so that it can relax. As someone holds the dog, the mother should sit with a baby on her lap. Never put the baby on the floor or hold the child above the dog’s head. Even if the dog isn’t aggressive, it may want to play and start jumping. 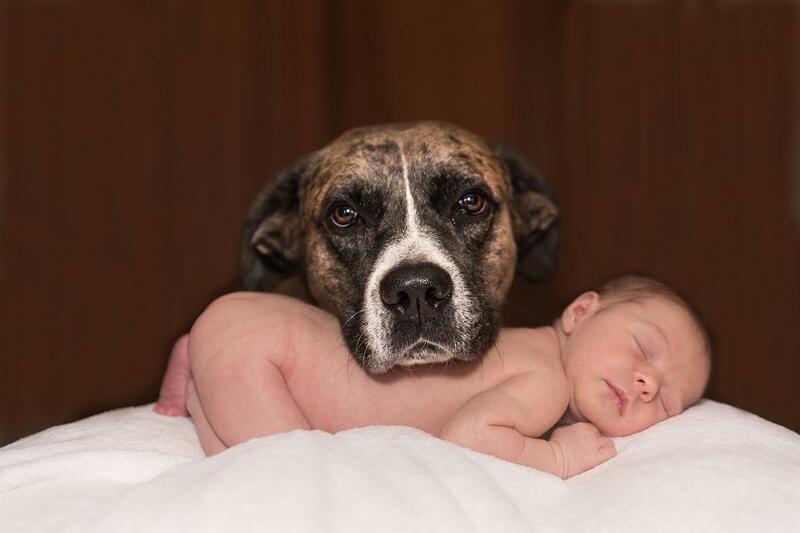 So, if there are no aggressive signs, let the dog come closer to the baby so that it can sniff the child. Licking should be avoided at first. Keep your dog on a leash at all times and be prepared to pull it back if necessary. You should repeat this for around three weeks. Essentially, you shouldn’t leave your baby alone with the dog during this period until you’re completely sure that the dog knows how to behave. Clear signs that something is wrong and that your dog doesn’t approve of the new family member are attempts of biting as well as the acts of growling and pawing. Also, pay attention to its body language. If the hair on the dog’s back is raised, its ears pinned back and its tail curled between its legs, you should keep it away from the baby. Soiling accidents as well as refusing to eat are also clear signs that the new family member is making the dog uncomfortable. You should always reprimand the dog with a strict “No!”. If it retreats and calms down on its own, you should reward your pet. It’s essential that you monitor your dog’s behavior for at least three weeks and take this time to properly train it. Puppies may be energetic but they can get used to the baby a lot easier. If you have an older dog that’s used to getting all of the attention, you should be a bit more careful and attentive. Positive reassurance is a must if you want your dog to accept the child completely. Once the three weeks are over and everything is going smoothly, it’s time to include the dog in your everyday routine. This means that you can spend time with your pet while you’re taking care of your baby. Stroke and cuddle the dog while holding your baby or while the baby is resting in the crib. When feeding the baby, give your dog a treat as well. You can also go for walks together. To make sure that your dog is at a safe distance from the baby when you lounge around or do some chores, get comfy dog beds that will show your pet where its own personal space is. You can get one of these for every room in your house. You still have to be very attentive since the baby can startle the dog or your canine friend can get too excited and playful at some point. Over time, you should teach your child to respect the animal as well. Teach your child how to approach and cuddle the dog without hurting it. Put some effort into showing the kid that your family pet is a living being that needs its space and comfort as well. As your baby becomes a toddler, feel free to give them some pet-related responsibilities such as giving food and water to your dog. Don’t fear the process of dog and baby bonding. If you take the right approach and show your pet that it’s still going to receive plenty of love and care while at the same time teaching your child how to respect the pet, you’ll encourage and nurture a very special friendship. This entry was posted in Childcare, Family, Parenting Tips, Toddler and Kids and tagged childcare, Indian baby blog, Indian Mommys Blog, Indian mothers blog, Indian Parenting Blog, indian pregnancy blog, indian womens blog, Parenting Tips. Bookmark the permalink.